After watching tonight's episode of Eureka* I realized that I had planned to post about the episode "What About Bob? ", which was one of the show's few biology-based episodes. The premise of the episode was pretty straightforward: one of the scientists - Bob - living in the enormous sealed biosphere under Global Dynamics has vanished, and Sheriff Carter has to enter the sealed ecosystem to figure out what happened to him. I think you might remember the Biosphere 2 project that was out there in Arizona and he was - my dad's a scientist, a medical doctor. And he was one of the primary consultants on that. So we have an episode that's about what does a biosphere in Eureka look like and what happens if some you have a missing persons case inside of the closed biosphere. Inside was a rainforest, an 850 square meter ocean with a coral reef, a 450 square meter mangrove wetlands, a 1900 square meter savannah grassland, a 1400 square meter fog desert, a 2500 square meter agricultural system, a human habitat with living quarters and office, and a below-ground level technical facility. Heating and cooling water circulated through independent piping systems, and electrical power was supplied from a natural gas energy center through airtight penetrations. The system apparently suffered from unexpected fluctuations in carbon dioxide and oxygen levels during its first (and only complete) mission. There apparently was much personal conflict within the project, exacerbated by low oxygen levels and a calorie restricted diet. I thought that the biosphere element of "What About Bob?" was pretty nifty. Sure, it's implausible that such a structure could be created underground (and that they would allow someone from outside to enter, even with a very thorough scrubbing) but it's well within the norms of the fantasy science of the show. And they got the interpersonal conflict bit right. The problem I had with the episode was with explanation of what happened to poor Bob. And just how did we settle on our snake man? One of our main inspirations for a story involving human mutagenics was David Cronenberg’s brilliant movie, THE FLY. Of course, we also love comic books and comic book movies, so The Lizard, one of SPIDER-MAN’s grooviest villains, also inspired us. So Bob's a monster-of-the-week. Unlike The Lizard, he didn't ingest a serum developed from reptile DNA to stimulate limb regrowth, and unlike the scientist in The Fly, he didn't accidentally become melded with a fly in a tragic teleporter accident. Instead, he's turning into a snake as an unexpected side effect of "mutagenic wavelengths" of light that alter the biosystem's water supply. That wouldn't have bugged me (much) if they hadn't turned to awful Star Trek science for the "technical" explanation. I'm thinking specifically of the Star Trek: The Next Generation episode "Genesis", where, by a very unlikely series of events, a disease emerges that activates "dormant genes" and "latent introns". The result is that the crew of the Enterprise "de-evolves" into other animals: Lieutenant Barclay becomes a spider, Worf turns into a reptile, and Captain Picard into a lemur. The whole thing makes no sense at all from a biological perspective. Humans don't have a bunch of "reptile" genes that became "dormant" during evolution. Instead, many evolutionary changes are likely due to differences in gene expression during embryonic development (see "What is Evo-Devo?" and "Regulating Evolution: How Gene Switches Make Life"). While babies are occasionally born with atavistic anatomical characteristics, such as tails, that doesn't mean they have turned into monkeys. Watch the Eureka episode "What About Bob?" at Hulu.com. * Note to Eureka's producers: tonight's episode had way too much advertising of Degree super-duper antiperspirant for men. When the ads came up - again - during the second commercial break, we almost changed the channel. And next week I'll probably tape it so I can fast-forward through the ads. It's not like I can miss the product placement during the show, anyway. ** The physics on Eureka is probably just as terrible as the biology, but I just don't care about that as much. 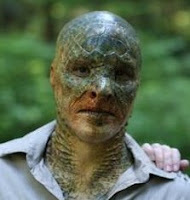 Image: "Bob" in a non-menancing moment, from EUREKA unscripted. The premise of the episode was pretty straightforward: one of the scientists - Bob - living in the enormous sealed biosphere under Global Dynamics has vanished, and Sheriff Carter has to enter the sealed ecosystem to figure out what happened to him.So we have an episode that's about what does a biosphere in Eureka Episodes look like and what happens if some you have a missing persons case inside of the closed biosphere. I agree that Eureka episodes tells as abt biosphere. Well the show is coming Back and going to be start on 10-June.I love to watch Eureka episodes and the show is Pretty good.